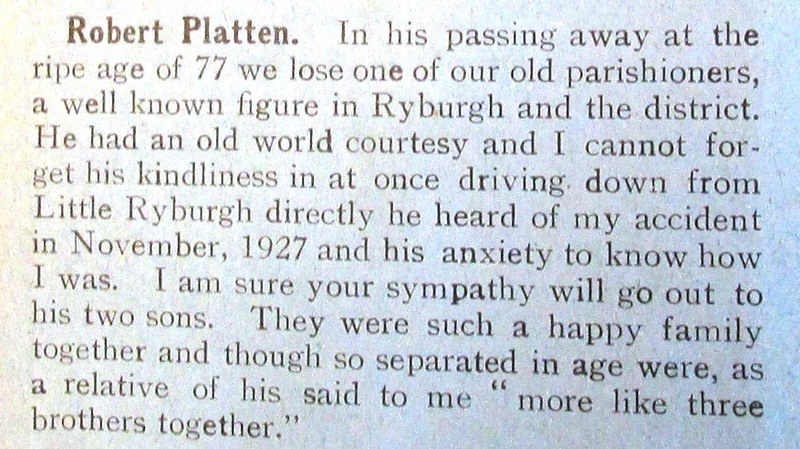 Richard Reginald Platten was born acording to Census returns in Little Ryburgh in 1889 to Robert Samuel and Mary Ann Elizabeth Platten. He was for some reason baptised in Edgefield on September 29th 1889 possibly because Morris Fuller would not oblige at Ryburgh? It seems the Platten’s were dissenters, in their case Primitive Methodists and we find Reg’s youngest brother Percy baptised in 1892 according to the Dereham Circuit Register. The surviving Ryburgh School registers begin on June 26th1908 and only include admissions retrospectively back to 1898 although it is most likely that he attended the school at Great Ryburgh and would have left by 1904. By the 1911 Census he was still single, living at Hill Farm Little Ryburgh and working as a Journeyman Butcher, i.e. one who had finished an apprenticeship but was not yet a “Master” By 1915, the year that he enlisted, he was living in Church Street, Reepham and is described there as a Butcher’s Cattle Dealer. Fortunately his service record survives and it shows that he was attested in Dec 1915 and appointed to the Norfolk Yeomanry on 31 March 1916 and had his vaccinations and inoculations in April and May that year. He married Ivy Norah Wilson in Salle Church on the 27th April 1916 between his 1st and 2nd set of inoculations! By October of 1916 Ivy had moved to White Rails Farm in Great Melton. This was a farm owned by the Evans Lombe family of Marlingford Hall and it was their J.P. landlord, E.H.Evans Lombe who witnessed Ivy’s declaration of Reg’s living relatives on Army Form W.5080 on June 7th 1919. Field Punishment Number 2 consisted of the convicted man being shackled in irons but not fixed to anything such as a gun wheel or similar as in the case of F.P. No1. He could only be shackled for up to 2 hours in 24 and not for more than 3 days in 4, or for more than 21 days in his sentence. Punishment was awarded in Reg’s case by Lt.Col. R Dyer-Bennet. On September 6th 1917, he received a G[un] S[hot] W[ound] to his Scapula and was treated on the following day by 17 F[ield] A[mbulance] He was appointed unpaid Lance Corporal in November 1917. By the 5th January 1918 and once more a Private, he was again in the care of 17 F.A. with “I.C.T Chest “. This probably means that his shoulder wound had never properly healed and he was “posted Depot” on 11 Jan 1918. In reality, this meant returning to England and spending the next 66 days in the Red Cross Castle Hospital at Sherborne in Dorset. Here, his “ICT Chest” diagnosis has “Old wound” in parentheses. He was granted a few days home leave from 27th March to April 5th 1918. Again he was in trouble as he failed to report to Ampthill until 8.30 the following day April 6th. His punishment on this occasion was a more lenient “Admonished” and the loss of 1 day’s pay, meted out by Col. The Duke of Bedford. He was back at Felixstowe with the 3rd Norfolks on July 4th and posted back to France with the 9th Norfolks on August 16th 1918. He probably knew by then that his Ivy was pregnant with their first child. He was “Killed in Action” on the 8th October 1918 so very near to the end of hostilities. Their daughter Iris Elaine Platten was born on Christmas Eve that year. A barely readable entry says that he was buried in High Tree British Cemetery 2 miles N W of Fresnoy –Le-Grande. The remainder is illegible. The page ends with a summary of his length of service as being 2 years and 193 days. When you have reorganized B,C&D Coys as on Coy you will send a liason first of 1 NCO &six Ptes to get in touch with the Americans at BRANCOURT in G 24 C central. With the remainder of your Coy you will take up a line of posts from C29 central to C.29.C.7.0. You will get [in] touch with A Coy 1st Leicester Regt on your right who are taking up a line from C.29.C.7.0. to I.5.G.3.4. Move up and occupy the BRANCOURT-FRESNOY-ROAD…..
From Reg’s Service Record Army Form 5080, we learn that in June 1919 his brother, Percy John formerly Lincolnshire Regt. was in India now a 2nd Lieut. with the 4th Suffolk Regiment. His other brother William Ernest not named above, probably did not fight though the reason is not known. Nov. 1915 Bertie Platten is better and is now in England at a Hospital in Birmingham. Dec 1915" We were glad to see Bertie Platten safe home,and looking so well in spite of his wound. He had many interesting things to tell about the war in the Dardanelles. Dec. 1919 Nearly all have now returned home from the various fronts and I feel sure I voice the feelings of the parish in extending a very hearty welcome to Percy and Bertie ("Knock") Platten and ………, all of whom have been absent and have been so far away. 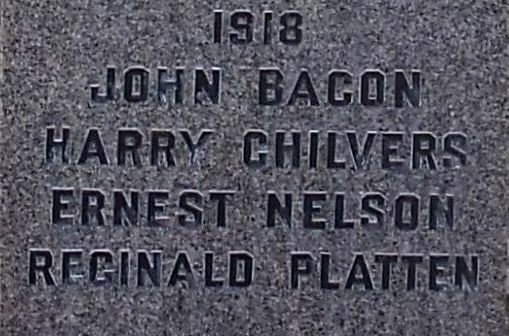 If anyone reading this page is a descendant of any of these Platten men and would be willing to share information or images to give a fuller picture we would be very pleased to hear from you . Just use this Contact Us link.